Our butterfly bushes are shipped in bare root currently 6-12''. They are well rooted, trimmed once or twice, and most will bloom this summer! By next July, they should be 3 to 4 feet high and attract butterflies (and hummingbirds) like a magnet. 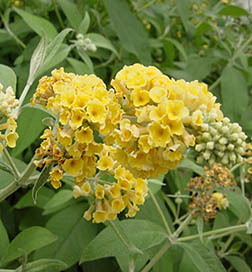 Butterfly bushes are hardy in zones 5 - 9. If you live in a colder zone, the tops in your butterfly bushes will likely die back over the winter. Even so, they will come back the next growing season bigger and better then before. Butterfly bushes prefer full sun (they must receive eight or more hours of sun a day to thrive). Buddleia x_weyeriana 'Honeycomb' (Yellow Butterfly Bush) This plant is native to western Central China. The plant reaches 12 feet in height with gray-green foliage and is deciduous or semi-evergreen in warmer climates. The branches arch and have narrow cone-shaped bunches of flowers on the tips of the branches. The flowers attract butterflies that feed on the highly scented nectar occurring in late summer or early fall. It is recommended that this plant be pruned in late winter to encourage shoots coming from the bottom of the plant. These canes are usually stronger and produce larger flower heads. This variety is a new introduction from Holland it is everblooming with fragrant orange-eyed deep yellow flowers. This variety performs great in sunny, hot sites and it can definitely bring a little sunshine into any garden!